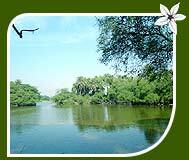 The Bharatpur Bird Sanctuary (officially known as Keoladeo Ghana National Park) is both a significant World Heritage Site and a national park. Sprawling over an area of 29 sq km, it is initially a bird sanctuary sheltering a variety of avian species, both resident and migratory. Bharatpur Bird Sanctuary begins teeming with life with the first shower of the rainy season. Chirrups, twitters, cheeps and even shrieks! But, the actual drama occurs when the winter migrants arrive here from as far as Siberia and Central Asia and mingle with the residents, resulting into the cacophony that is Bharatpur National Park. 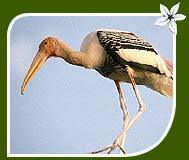 The vegetation of the Bharatpur Bird Sanctuary chiefly comprises kadam forests and grasslands. Shallow lakes also cover a considerable part of the parks area. So, there is an opportunity for you to explore the avian riches in a boat. 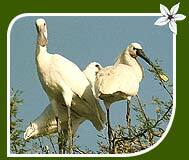 Bird sanctuary happens to shelter around 350 exotic species of birds. Bird watchers and ornithologists keep coming here time and again. The cynosure of all eyes in the sanctuary is ofcourse the Siberian Crane, a highly endangered species. Winter migrants arrive in December and make their stay here until early March. Most commonly sighted bird species include pelicans, geese, ducks, ibises, egrets, eagles, hawks, warblers, wheatears, flycatchers, buntings, larks, shanks, stints, wagtails and pipits among others. Mammals and reptiles also attract a good number of spectators here. The prominent among mammalian species are golden jackal, striped hyena, fishing cat, jungle cat, nilgai, sambar, blackbuck, wild boar etc. Reptile lovers can enjoy the sights of the python soaking up the warm sun. Remember to visit the Bharatpur Palace which is yet another example from Rajasthan typifying a fine blend of the Rajput and the Mughal architecture. Another attraction for visitors to the sanctuary is the Lohagarh Fort. The fort happens to be one of the most invincible strictures in Rajasthan belonging to the medieval period. Also visit the Bharatpur Government Museum which lies close to the Bharatpur Palace. Here, you will come to see royal antiquities belonging to the royal families of Bharatpur. Enjoy a boat ride along the Bharatpur Lake, either in the morning or evening. Its an experience you would love to remember. The Forest Department offers boats on hire. You can also choose to take a leisurely rickshaw ride through the sanctuary. And dont underestimate the rickshaw-pullers, as they have been specially trained by the forest officials. Tourists can easily fly to the Kheria Airport of Agra, 56 km away. Further, they can hire a tourist taxi or take a bus to get to the national park. One can also access Bharatpur by rail, as the Bharatpur Railway Station is a convenient railhead, lying at a distance of 6 km from the sanctuary. Regular train services connect Bharatpur with important cities like Delhi (200 km), Jaipur (176 km) and Agra (56 km). During your trip to the Bharatpur National Park, you can choose to stay at the wildlife resorts and lodges to add much to your experience. Available options are as follows.